Australia Day had arrived. Kid 1 and myself decided to bake something in the spirit of the day. (Why not heat up the kitchen on an already hot and hazy day?) 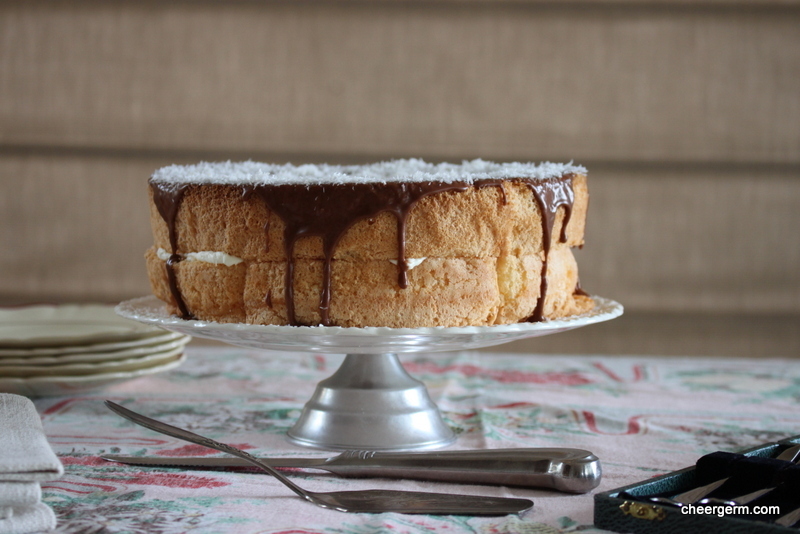 We decided upon a cake version of the iconic Aussie lamington. The perfect opportunity to try out a gluten free sponge recipe the Mothership had given me. Most accounts state that this dessert was named after Lord Lamington, a governor of Queensland in the 1800’s. It is also much loved in the country of my birth, New Zealand. 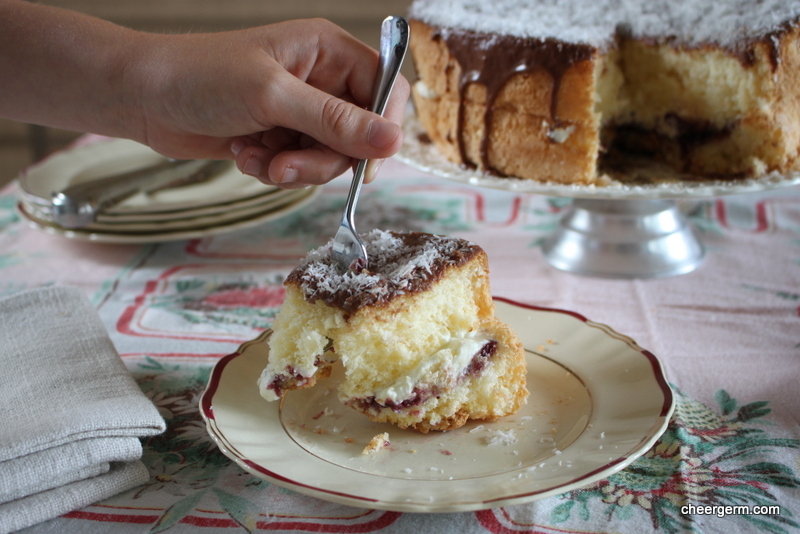 My maternal grandmother adored these dipped in chocolate and coconut square sponges, particularly when they were sandwiched with raspberry jam and fresh cream. 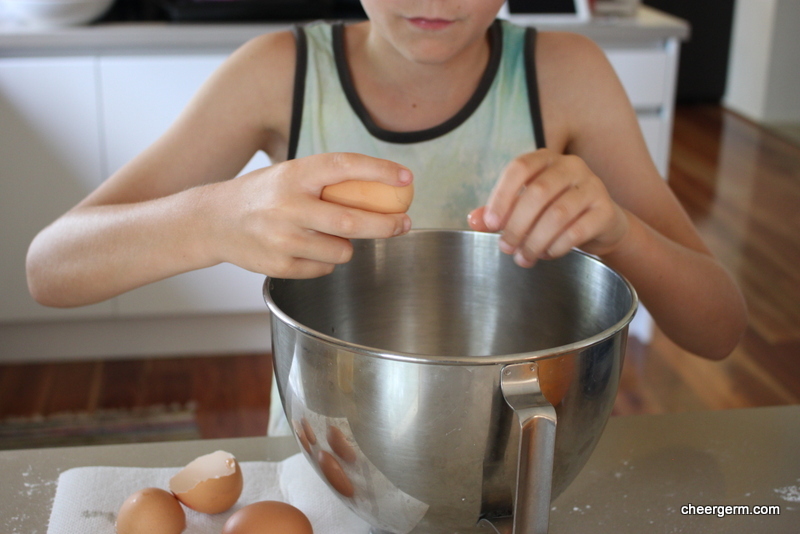 Kid 1 was a keen apprentice, cracking eggs and jokes like the best of them. The sponge rose to the heavens and all was well with the world. Due to the days increasing heat, we decided to cool the cake downstairs. It was proudly placed on a chest of drawers near the stairs, which seemed like a good idea at the time. Half an hour went by and off I trotted to check the cake. The once magnificent, feather light sponge now had huge chunks missing from the side and there was a Hansel and Gretel trail of crumbs around the base of the stairs. Roaring in dismay, I looked up to see our dogger Elvis, standing there, guilty crumbs still attached to his fluffy bearded face. He had cleverly managed to squish his doggy snout in between the stair banisters and reach the cake. So, yes, the dog ate my homework. No photos were taken of this once glorious behemoth on that day. (Well, except for one iPhone photo.) We cut off the dog slobbered upon portions, sliced it and added jam, cream, the icing and coconut. It was still delicious, if only half the cake it should have been. Kid 1 and myself remade this cake a few days later and whilst it was not quite as glorious looking as the first, Kid 1 stated that it was lighter and fluffier. In terms of a cloud like sponge, this easy recipe ticks all the boxes. You do not need to separate the eggs, nor does it require any fancy gluten free flour blend. The Yak was just pleased to be given two gluten free cakes in one week. Whereas our wee canine friend should count his lucky stars he got to enjoy any at all. 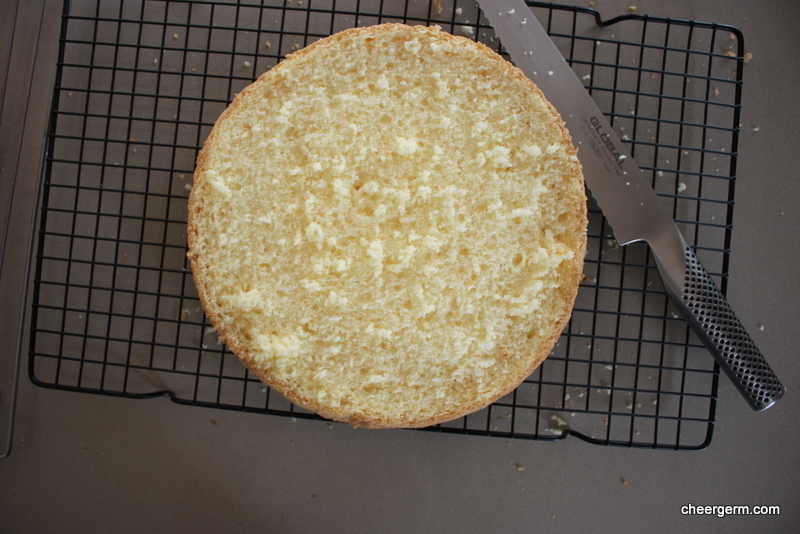 Just a quick note on sponge baking. It’s vital to ensure that your eggs are at room temperature. Cold eggs do not hold the same volume of air as a warmer egg will and do not whip up as well. Sifting your dry ingredients twice is a good idea and never open the oven door before the minimum cooking time is up or your sponge will sink. Sift the cornflour and baking powder into a medium sized bowl. Sift half of the cornflour mixture over the egg mixture and fold it in gently, then sift the remaining cornflour mixture into the bowl and fold it in gently. Let the cake stand for five minutes then remove onto a wire rack to cool completely. Icing: Sift the icing sugar and cocoa together into a medium sized bowl. 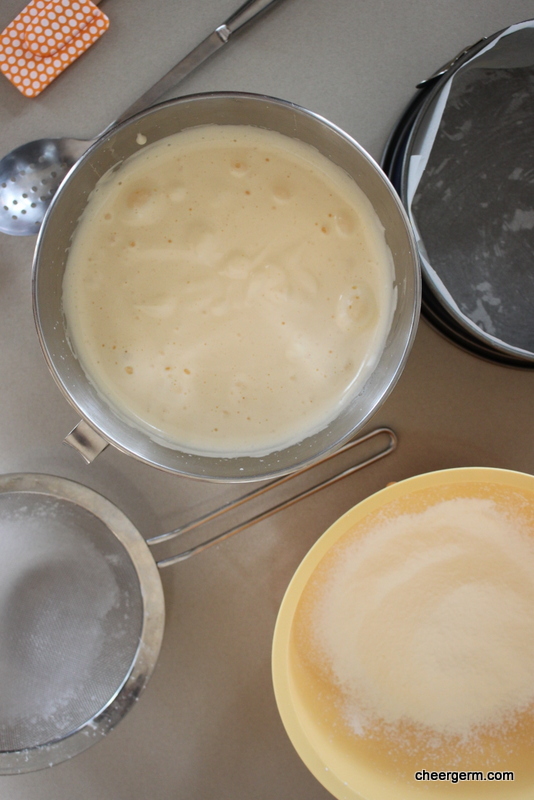 Add the melted butter, then slowly add boiling hot water, mixing until the icing is a smooth, coating consistency. Assembling: Slice the sponge in half, add a thick layer of jam on the bottom layer, goop on mounds of delicious cream (as much or as little as you fancy) and whack the other half of the sponge on top. 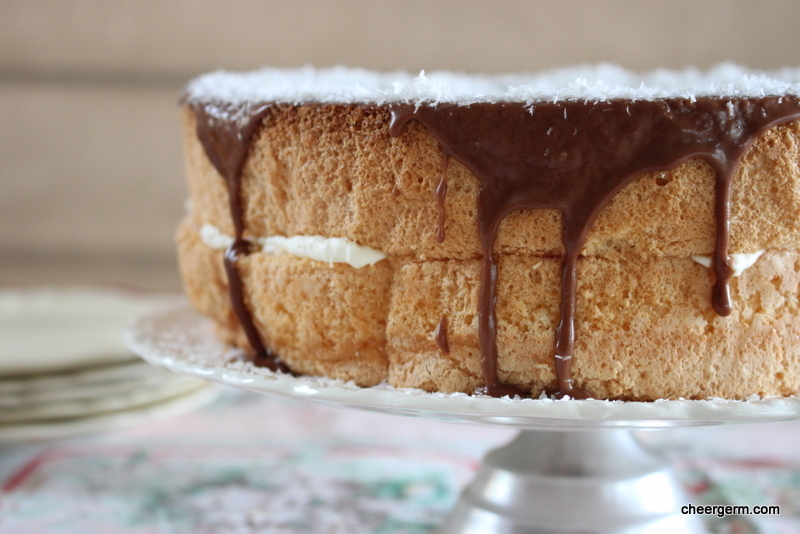 Drizzle the chocolate icing over the top, then sprinkle generously with the coconut. Eat some. You won’t regret it. Cooking Notes: having made this cake twice now, next time we will make a chocolate ganache instead of icing. Just to make it even more decadent. 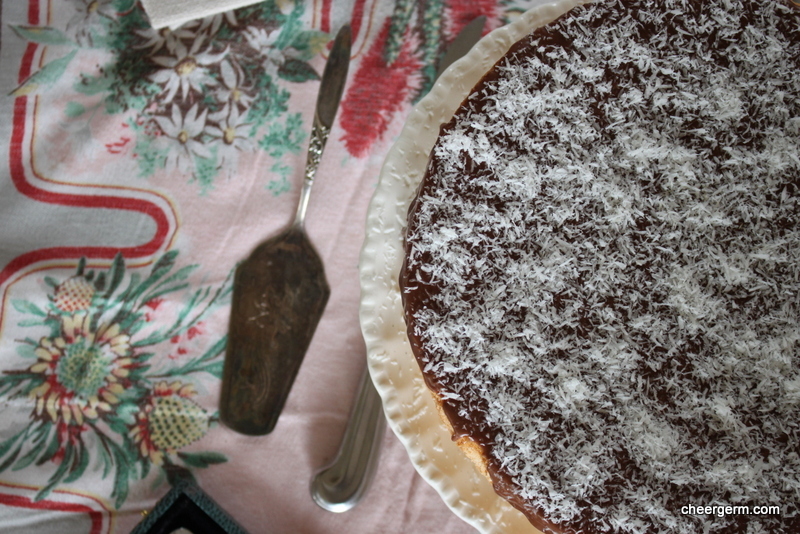 This entry was posted in Family memories, Gluten free baking and desserts and tagged Australia Day, baking, cheergerm, Cooking, cornflour, dog stories, food, gluten free, gluten free lamington cake, gluten free sponge, recipes. Bookmark the permalink. Poor Elvis! Now I understand why he ain’t nothing but a hound dog….and in the dog house to boot! Cake looks heavenly. Happy belated Australia Day! Wow! You can just see how fluffy that sponge is by the pictures. No wonder Elvis wanted his share. Happy Australia Day (belated). Spent the evening of AD here in Athens with a bunch of Aussies – many students over here in Athens at the moment doing “summer” courses in the midst of our winter. Thanks KW! 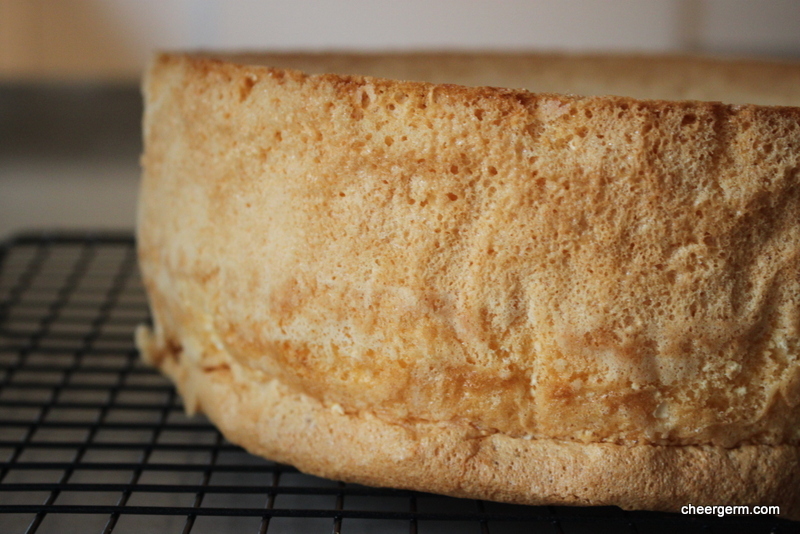 It really is a fluffy sponge recipe, will become a real standard recipe methinks. Can’t blame the wee dogger I suppose. I hope it was a nice and cheerful expat Aussie celebration. I hate making wide sweeping statements Kate but this is the best gf sponge cake recipe thus far. It would also be tops with strawberries and cream and a chocolate sponge is a great idea. Yum, yum! I’ll take that as a strong hint to go and buy the cornflour pronto, then! Thanks CJ, it didn’t taste half bad either. 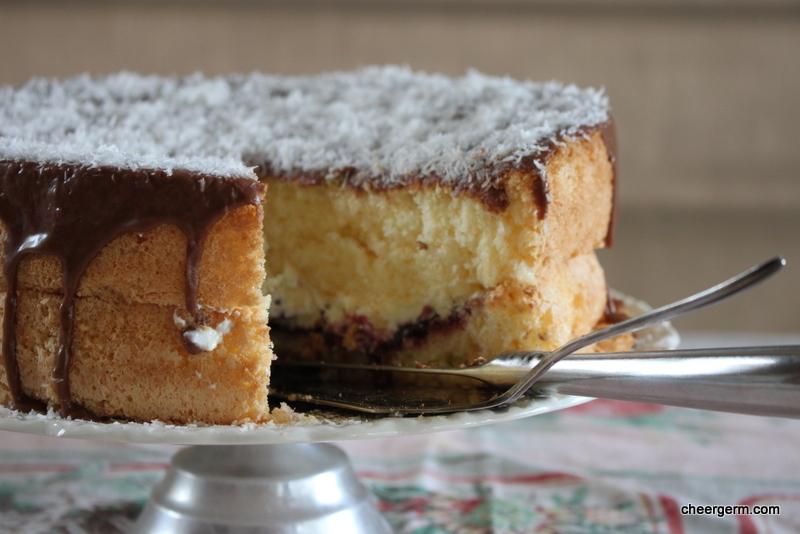 The combination of sponge cake, jam, cream, chocolate and coconut is mouth-watering! I’m intrigued that you can make a fluffy sponge using what we in the US call “corn starch.” Do you often make GF cakes with it? It’s amazing how it turns out, I may add a little bit of cornflour in to a GF flour blend but do not usually use it alone. This is a delicious combo indeed LM. I haven’t had cake in a long time. I may have to buy myself a springform pan! The dog actually did eat your homework! Yes! If only I’d known you when I was at school. My teachers never believed me. How interesting! I never knew that about eggs and I can see by the looks of that spongiest of sponge cakes that you definitely know of what you speak! Looks delicious! Brilliant photos as per your norm of course but also enjoyed the addition of bits of Kid 1 in there! such a gorgeous lamington! I want to dive through my screen and cut myself a huge hunk of this delish cake. Really, I am with Elvis on this – who can blame the hound for wanting to try such a marvellous cake? Awww, hahaha! You poor things! But hey at least you managed to still preserve the rest of it, at least your dog left you guys some! Haha!! Yes, I am grateful ‘Sir Dog’ didn’t eat all of the first cake and ‘chose’ to share it with us!! But he only got a sniff of the second! Thanks Cake. 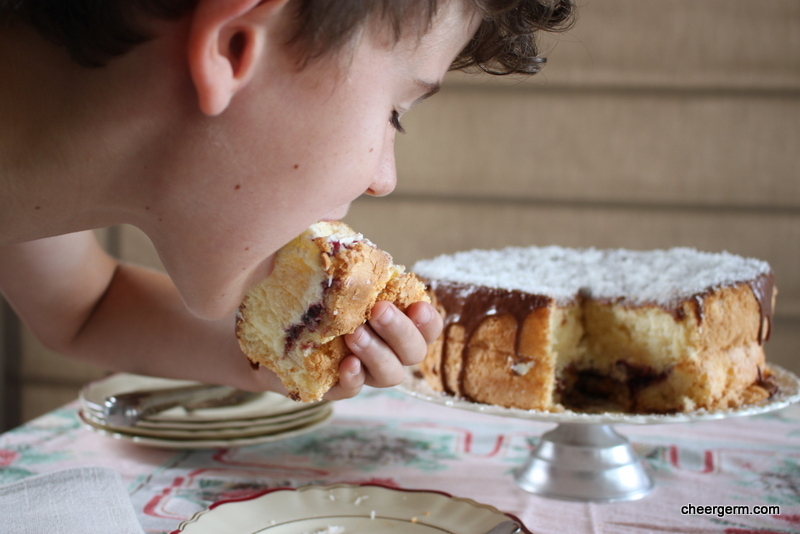 It was fun baking and taking photos of the kid..put a bit of pep in my step! Kids in the Kitchen- perfect spot for them. The cake looks sensational. Thanks Francesca! Yes, you are soooo right, can’t wait to get both sproglets cooking more this year. They are fab hey! Guess you can’t go buy one so you will have to make your own!